While he looked to be in discomfort coming off the ice, Crosby stayed in this game as well. In fact, there’s no mention whatsoever of Crosby’s injury in the official game recap on nhl.com. 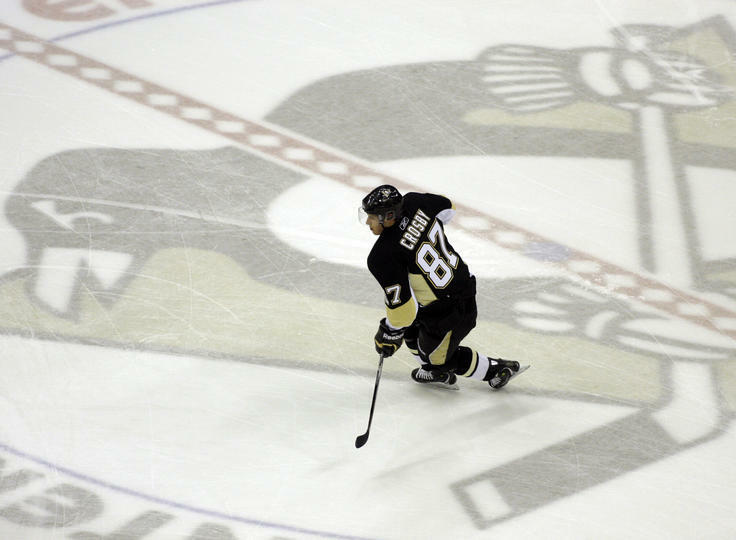 A few days later on January 9th, Head Coach Dan Bylsma announced that Crosby had a “mild concussion”. The initial timeline on the injury was that he’d miss at least a week. Now 45 weeks later, Sidney Crosby is set to make his return to the NHL. Despite his incredible ability, not everyone likes Sidney Crosby. Some grew to dislike him early in his career, calling him a whiner for the way he dealt with the increased attention paid to the game’s newest phenom. (People said the same thing about Gretzky early in his career). But regardless of your opinion about him as a player, there’s no denying that Crosby is the single most recognizable figure in the game of hockey. And when healthy, he’s not only the best player in the league, but also the NHL’s strongest ambassador. In a league that has very little economic stability beyond the traditional hockey markets (Canada/the original six), there’s no overstating Crosby’s importance in growing interest in the game. The comeback has been a long time coming. On September 7th, Crosby let the world know he was on the road to recovery. Though his 40-minute press conference gave very few details on the extent of his past brain trauma, Crosby maintained that he never once considered the possibility of retirement. Now after 5 weeks of vigorous practice with the team, Crosby is finally ready to go. Naturally, this raises questions: Can Crosby play as well as he did prior to the concussion? Are the Penguins now a favourite to win the Stanley Cup? And most important of all: is another concussion a matter of if, or when? Firstly, I think Crosby can return to the player he was – it just won’t happen overnight. No one should expect his usual level of production this season, as it’ll take him a while to get back into peak physical condition and re-adjust to the pace of play in the NHL. A similar case is that of Patrice Bergeron, who suffered a very serious concussion in the fall of 2007 and missed the entire 07-08 season. He returned the following season and posted only 39 points – tying his career low that he scored as an 18-year-old rookie. Now 39 points would be a drastic decline for Crosby, but if he plays around 60 games, 60 points is realistic. Secondly, Crosby’s return makes the Penguins an instant cup favourite. They’ve been at or near the top of the Eastern Conference most of the season without him, and with the Caps struggling mightily as of late, it’s hard to find a team that’s more well-equipped to go the distance. As for the million dollar question, it’s difficult to say. Though the chances of Crosby playing out his career without suffering another concussion is slim, it’s entirely possible that the next concussion could be minor. Patrice Bergeron and David Booth have each experienced severe concussions, returned to action, and suffered yet another concussion. However, their subsequent concussions were both minor by comparison, and each has been healthy since. On the other hand, Marc Savard is unofficially retired at this point, having suffered a major concussion in March of 2010, and a subsequent concussion this past January. However the difference between Bergeron & Booth versus Savard is that the latter had a long concussion history. Savard has experienced no less than 5 concussions, dating back to 2001, and had at least 3 prior to the Matt Cooke elbow in 2010. As for Bergeron and Booth, neither had any significant concussion history prior to their incidents; the fact that Crosby’s case is comparable to theirs brings Crosby fans –and the entire hockey community – a measure of hope. If Sidney Crosby were to retire today, he’d already be one of the most decorated hockey players in history. He’s won the Stanley Cup, an Olympic gold medal, and a World Junior Championship. He has also won most of the major individual awards, including the Art Ross as the NHL’s leading scorer, the Hart Trophy as league MVP, and the Lester Pearson, which goes to the league’s best player, as voted on by the players. Virtually the only major honour that eludes him is the Conn Smythe Trophy – playoff MVP honours won by Evgeni Malkin in 2009. But Crosby doesn’t play the game just to rack up individual honours; those who know him say they’ve never seen anyone who’s more driven to win. And beyond the skill he brings to the ice, it’s that competitiveness that truly sets him apart from everyone else in hockey today. And for that reason, it’s hard to bet against him when he sets his mind on something. So if Sidney Crosby believes that he will play at a high level for the next 10 years or more, I have a hard time believing otherwise. And that’s a great thing for the people of Pittsburgh, and hockey fans everywhere. This entry was posted in Uncategorized and tagged Crosby at risk, Crosby back, Crosby future, Crosby hurt again, Crosby playing, Crosby prediction, Crosby protection, Crosby safe, Sidney Crosby, Sidney Crosby concussion, Sidney Crosby healthy, Sidney Crosby Returns by Peter Siamandas. Bookmark the permalink.